Bull offers a wide range of systems, infrastructure solutions and services, based on focused innovation, alliances with the best partners, and our own expertise developed through many years of working with some of the world's largest businesses and governmental organizations. We provide a comprehensive array of managed services, professional services, and disaster recovery solutions for commercial and Public Sector clients. We bring world-class project management, total dedication, stability, and reliability that customers expect from an IT partner. In a market driven by a central promise: to regain control over the proliferation of servers; bullion, a Bull designed system, goes a step further in virtualizing business critical applications. Based on a modular architecture, and natively embedding the VMware ESXi virtualization hypervisor, bullion is the answer to enabling IT departments to consolidate Xeon-based business applications while providing reliability and simplicity. 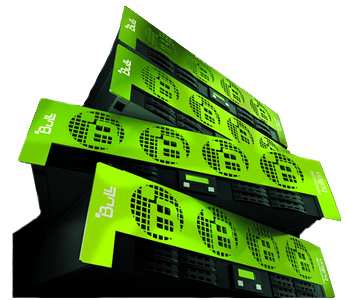 Bullion is the world's fastest x86 enterprise server, designed specifically for the virtualization of business-critical applications. The technical alliance between Bull and VMware offers a unique quality of service and an optimal flexibility. The benchmark – which was run on a ‘fat’, 16-socket configuration – highlights bullion’s exceptional characteristics, which make it almost twice as powerful as all its rivals. Featuring 160 Intel Xeon E7 cores and 4 Terabytes of RAM, the bullion server achieved peak performance of 4,110 according to the SPECint2006 benchmark. The fastest competitive system only managed a performance of 2,180. Equipped with between two and 16 Intel® Xeon® E7V2processors, with up to 24TB of memory, bullion is the only x86 platform capable of responding flexibly, securely and cost-effectively to all your challenges. The ability to dynamically reconfigure bullion (Software Defined Hardware) – for on-demand capacity expansion – means it offers unrivalled elasticity in the face of changing needs, especially for the Cloud, Big Data and critical applications. Bullion cloud platform is a complete solution combining the power of high-end servers designed and manufactured, with the best technologies from highly respected partners such as VMware’s vCloud, EMC storage and Brocade networking solutions, and Bull’s own well-regarded security technologies. An infrastructure that meets even the highest demands in terms of security, scalability and performance. VSPEX Proven Infrastructures deliver predictable performance that significantly reduces the planning, sizing and configuration burdens of adopting private cloud or end-user computing environments. Bull and EMC are working together to deliver a series of new Reference Architectures supporting enterprise-class workloads through the use of Bull bullion servers in conjunction with EMC VNX storage and Brocade VDX switching technology. Bullion is specifically designed to virtualize business-critical applications. It meets the high availability requirements of business-critical applications and the high computing power requirements of ERPs and large databases. With its native virtualization capabilities based on VMware technology, bullion makes it possible to run multiple critical applications simultaneously, on a single machine. Native virtualization and resource sharing reconcile high performance, simplified administration and intelligent energy efficiency. ScaleUpServers.com is a division of Virtual Graffiti Inc, an authorized Bull Partner.